Scrub away those dead lip cells! Such a simple and sweet beauty product can revolutionize your life and it did for mine! Ambrosia Cosmetics is a beauty supply store right here in Trinidad that is also in the business of making products that would suit the Caribbean clientele. I started off with their lust dust eye-shadow pigments a long time ago and now I'm venturing into their skin and body care lines. Let's see how sweet we can get with these sweet lips. This product I got at the Ambrosia Cosmetics pop shop at the Caribbean Beauty and Nail Show 2015 hosted at the Center of Excellence. So I got some information about the product straight from the gorgeous lady and beauty creator herself. 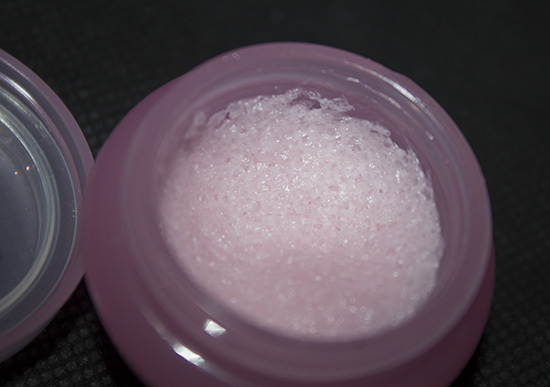 As stated on the packaging it is a sugared lip scrub and on application you can feel the sugar granules on the lips which is what by gentle motion of the product causes the exfoliation. The rest of the base feels like a soft cream. Use a little of the product and apply to the lips, rub gently all over with your fingertips to soften the lips. It is gentle enough to be used daily. It leaves the lips looking moisturized, not greasy. The product is packaged in a hard plastic round case with screw cap lid. On opening this lid there is another clear lid to secure the product within, maintaining the moisture. However there is no label with the ingredients list on the container. You can find the ingredient list though on their website. The main ingredient is shea butter which is moisturizing to the lips. The pink package indicates it is strawberry kiwi flavored but the product is available in a green package as well to indicate a mint chocolate chip flavor, while the white package indicates a frosting flavor. As simple as this product seems I did enjoy its effectiveness and instant smoothness and softness it brought to my lips. I have now incorporated its use as a weekly/ biweekly beauty ritual. If you want to make your own version, just add some brown sugar to a soft lip balm. Use white or any refined sugar which usually has smaller grains for a gentler scrub. 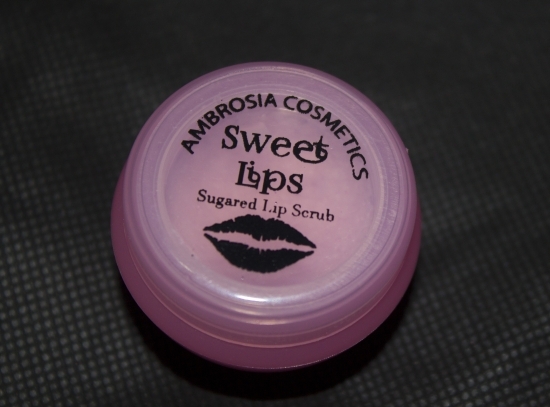 Find Ambrosia Cosmetics at the Online Website or on Facebook.